Some stress can be good - in fact, many of us need some kind of mental pressure to get going. However, when stress levels are too high they commonly trigger fatigue. Stress and worry are two emotions that most frequently cause tiredness. Some people say that when they have no control over a situation it makes them feel frustrated, irritable and tired. Depression can lead to tiredness for many reasons. tiredness is more common among women than men. On most occasions, fatigue can be relieved after a good night's sleep. However, this is not the case for everybody. Some people find that tiredness becomes a chronic problem which undermines their day-to-day functioning. 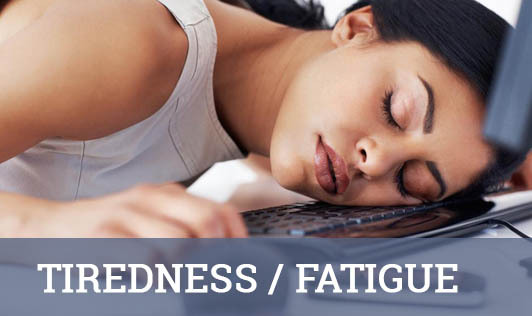 Tiredness can be caused by several different factors. 1) Aim for a regular sleep routine. 2) Eat and drink in a way that helps you sleep better. People who have a well balanced diet tend to be better sleepers than those who don't. 3) Become physically more active. Unfit people are more likely to feel tired, meaning they often don't exercise enough. Make sure your physical activity increases gradually. If the simple steps cannot solve your problem, seek professional help.